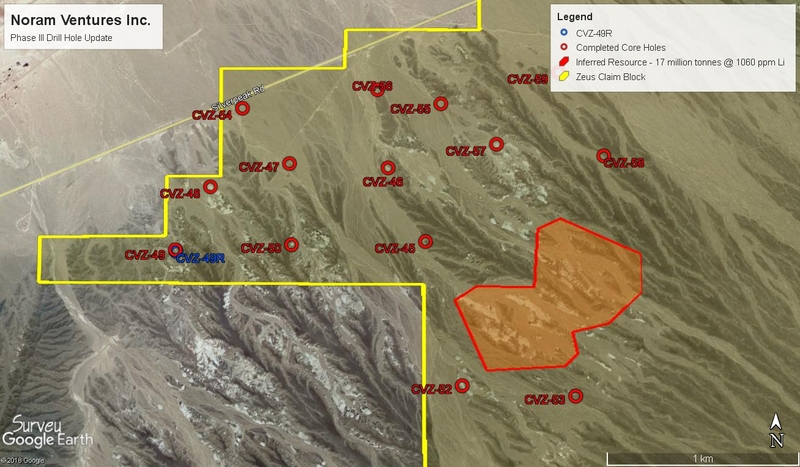 VANCOUVER,BC / ACCESSWIRE / December 13, 2018 / Noram Ventures Inc. ("Noram") (TSX - Venture: NRM / Frankfurt: N7R / PINK: NRVTF) is pleased to provide first assay results from the Phase III drill program on Noram's flagship Zeus property in the Clayton Valley, Nevada, USA. Assays from Noram's first drill hole, (completed on November 19, 2018), of its Phase III drilling campaign have been released by ALS Laboratories, Reno, Nevada, USA. As described in the release dated December 5, 2018, the geologic log showed that the top 85 feet (26 meters) of the hole contained olive green claystone and mudstone very similar to that seen in holes within the resource area. The bottom 15 feet (4.6 meters) contained gray, green and brown limestone, sand and conglomerate along with some mudstone. CVZ-45 may well be deepened at a later time to determine the significance of the sandy, conglomeratic layers in the lower part of this hole. Samples were taken at 5ft intervals, the results of which are provided in Table 1 below. Assays from hole CVZ-45 yielded an overall average lithium grade of 1104 ppm for the entire 100 foot (30.5 meter) length of the hole. The hole was located approximately 1150 feet (350 meters) northwest of the edge of the previously announced 43-101 compliant inferred resource of 17 million tonnes at a grade of 1060 ppm Li. The results indicate that the same mineralization seen in the resource estimate continues to the north and west with little, if any, change. Table 1 - Results of drill hole CVZ-45. Samples taken at 5ft intervals over a depth of 100ft. "Noram is pleased with the results of CVZ-45. Portions of the core assayed as high as 1900ppm. This program was designed with further defining the size and significance of the resource in mind; Noram is confident that it will successfully do so. We look forward to the receipt of the balance of the drill results," stated Mr. Mark Ireton, President and CEO. Additional assay results from the second Phase III hole, CVZ-46, which occurs 2550 feet (780 meters) northwest of the resource area were also received. CVZ-46 contained all green and blue claystones and mudstones with an average of 681.1ppm. CVZ-46 had a total of 39 feet (11.9 meters) of the chemically reduced blue claystones and mudstones. Table 2 - Results of drill hole CVZ-45. Samples taken at 5ft intervals over a depth of 100ft. "We are just beginning to understand the magnitude of this resource," stated Mr. Ireton. "The fact that we have stepped out almost 1km from the original resource area on CVZ-46 and still see these types of concentrations of lithium provides great insight into the potential for this Property and the resource that it hosts. Phase III has drilled an additional 35% of the property as compared to Phase I and II where a mere 15% was explored." To date in Phase III, a total of 15 holes have been completed to a depth of approximately 100ft. The overwhelming majority of the holes have intersected the green claystones and mudstones seen in the Phase I and Phase II drilling campaigns and which resulted in the initial inferred resource. Once the program has been completed and the assay results are returned, an update NI43-101 report with a new inferred resource calculation will be completed. The technical information contained in this news release has been reviewed and approved by Bradley C. Peek Msc. and Certified Professional Geologist who is a Qualified Person with respect to Noram's Clayton Valley Lithium Project as defined under National Instrument 43-101. Noram Ventures Inc. (TSX - Venture: NRM / Frankfurt: N7R / OTCBB: NRVTF) is a Canadian based junior exploration company, with a goal of developing lithium deposits and becoming a low - cost supplier for the lithium industry. Noram's long term strategy is to build a multi-national lithium minerals company to produce and sell lithium into the markets of Europe, North America and Asia.